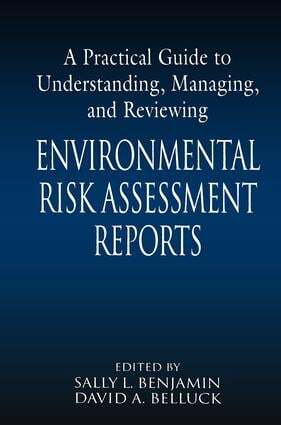 A Practical Guide to Understanding, Managing and Reviewing Environmental Risk Assessment Reports provides team leaders and team members with a strategy for developing the elements of risk assessment into a readable and beneficial report. The authors believe that successful management of the risk assessment team is a key factor is quality reports. Leadership first clarifies the roles of each participant and the unique technical factors of their respective disciplines. Teamwork is achieved through an emphasis on common language and procedures. Belluck and Benjamin explore a variety of techniques for creating accurate and useful reports. An example is Proactive Risk Assessment, which breaks a project into discrete parts to be delivered on an interim basis. This method, based on iterative review, drastically increases the chance of detecting errors while they can still be corrected. The authors emphasize rigorous standards by which reports are audited, evaluated and critiqued. The goal is to create reports that are accurate, useful and, adaptable on an industry-wide basis.